Ever want to harness the power of the Sun? Me too, especially for allowing for a clean way to help keep my mobile devices running without interruption. Even though you probably should put down your phone when enjoying a nice camping trip, that doesn’t mean you should let it die completely. That would be irresponsible. ZeroLemon is probably the highest quality affordable solar charging solution there is. And we have a ZeroLemon solar charger with 1.2W capacity solar panels and a 20,000mAh battery just waiting to make your gadgets happy for 50% off at $49.99. Many heat, very degrees, much energy. 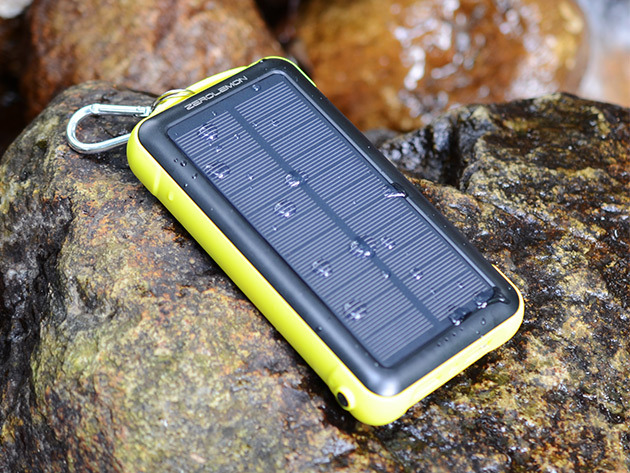 ZeroLemon, keep your devices charged, even in the pouring rain. The Sun really does have the power, enough to charge two high capacity phones twice over, at least. That and the solar panels are sensitive enough to recharge in a very reasonable amount of time. That and it’s rugged, so you can enjoy delicious powah in all conditions, from a snowy tundra to the peak of Olympus Mons. It might not be sensitive enough to work on Pluto, however. Here on Earth, though, you can enjoy good clean and green solar power for $49.99. Why not go green this summer and enjoy those gorgeous rays in more than one way?